ANCHORAGE, Alaska (AP) — A search that includes 17 FBI agents has yielded no sign of a 10-year-old girl who went missing in a remote, largely Inupiat Eskimo town north of the Arctic Circle on Alaska’s western coast, prompting authorities to investigate whether foul play was involved. 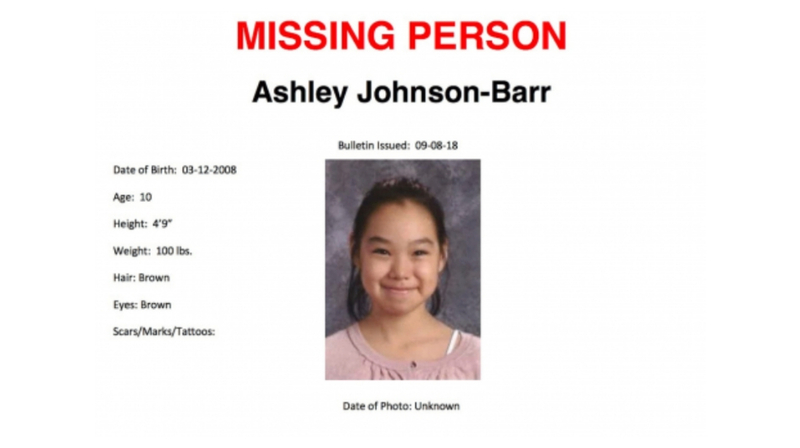 Ashley Johnson-Barr was last seen playing with friends at a local park in Kotzebue a week ago. Her cellphone was later found a half mile from Rainbow Park, in the opposite direction as her home in the community of about 3,100 people. Since the disappearance, volunteers, Kotzebue police and others have conducted searches. A Coast Guard helicopter and aircraft from wildlife troopers also have been used. Alaska State Troopers, the lead agency in the case, said Thursday that authorities are shifting their focus from a search and rescue mission to a law-enforcement investigation. A search also will continue around coastal areas and around access to water, troopers said. Lt. David Hanson said in a statement the probe also is looking at whether a crime might have been involved. He said authorities also need the public’s help. “We are confident that someone in this community knows what happened to Ashley and needs to come forward and share that information with us,” Hanson said. Kotzebue, 26 miles (42 kilometers) north of the Arctic Circle and 550 miles (885 kilometers) northwest of Anchorage, is a regional hub for northwest Alaska villages. The town is built on a 3-mile-long (5-kilometer-long) spit, and many there live a subsistence lifestyle far off the state’s limited road system, with 26 miles (42 kilometers) of local gravel roads used by vehicles in warmer months and snowmobiles in winter. The community has a chronically high unemployment rate, with the school district, state and local hospital among its major employers. Dozens of locals gathered Wednesday evening at Rainbow Park to pray and share hugs and tears over the missing girl, an honor student, Anchorage television station KTUU reported. The girl’s family could not be reached by The Associated Press Thursday. But her father, Walter “Scotty” Barr told KTUU in Kotzebue Wednesday that he didn’t know about the prayer gathering beforehand. “It goes to show the love of the community and everyone who has helped,” he said. The girl has attended Sunday school at the Kotzebue Bible Baptist Church. Pastor Tim Ungry said the church has been taking food to the family and praying for them. “They’re keeping strong, but they need a lot of encouragement and prayer,” Ungry said. The FBI got involved in the case at the request of troopers, according to FBI spokeswoman Staci Feger-Pellessier. Altogether, 17 agents are currently assigned to the investigation, arriving this week to assist, some traveling from the Lower 48. Ten troopers and three Kotzebue police officers also are working on the case. Feger-Pellessier said earlier this week that it’s not unusual for the agency to deploy numerous agents. On Thursday, she referred questions about the case to troopers.